Sturm, Ruger & Company, Inc. (NYSE-RGR) is proud to announce that it has signed Maggie Reese Voigt to its professional shooting team. Maggie takes the sixth spot on Team Ruger, led by Captain Doug Koenig. In addition to serving as a competitive shooter for Ruger, Maggie will also represent the Company as an official Brand Ambassador. "We are honored to welcome Maggie to Team Ruger," said Doug Koenig. "Adding a Multi-National Champion to the team certainly raises the bar for us. Her experience is a great asset to our team and we are excited to see her compete in Ruger Red." "When Ruger approached me about joining the team, I just had to say yes," said Maggie. "I have long-admired Doug's shooting career and have seen first-hand how well Ruger firearms perform at the highest level of competition. 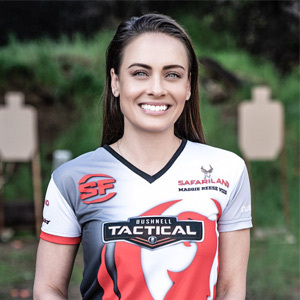 I am very excited for the season ahead and proud to be representing a company that has a passion for developing and producing quality firearms."